Where You’re a Neighbor, Not a Number. We recognize that buying a home is an incredible life event and we feel honored to be part of that experience. We also know that buying a home is not a quick or simple decision. To help you through the process, Kalamazoo Mortgage provides professional services from the time you first consider owning a home, and continuing even after you become a homeowner. We are proud of the work we do and we look forward to helping you finance, or refinance, your dream home. 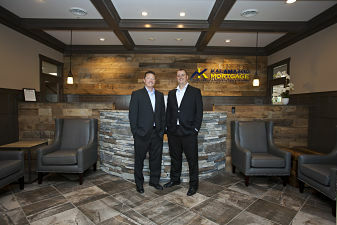 Co-founders and Managing Partners Brian Methner & Ryan Rarick founded Kalamazoo Mortgage in 2011 on the idea that there was a better way to originate mortgages. It was from the vision of treating people like neighbors, not numbers that Kalamazoo Mortgage & the KM Mortgage Group was born. Since 2011 our team has helped nearly 3000 homeowners throughout Michigan, Indiana, Illinois, Wyoming, and Florida purchase the home of their dreams. Our mission is to deliver the dream of homeownership while putting our clients first, delivering a five-star experience, and giving back to the communities we serve. We proudly serve borrowers through our many locations in Michigan and throughout the country. It is our goal to provide the best possible service to our “neighbors” and make the loan process as simple as possible. Our trained mortgage professionals will guide you through the entire process and get you the best possible loan for your current situation. To learn more about us and how we can help you on your path to home ownership, call us today toll free at (888) 303-9326.